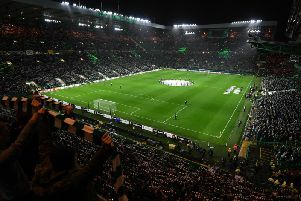 BT Sport has confirmed it will screen live coverage of Celtic’s Champions League third qualifying round second leg tie with AEK Athens in Greece. Darrell Currie will be joined by former Parkhead duo John Hartson and Stiliyan Petrov. Chris Sutton and Rory Hamilton are on commentary duties while Eilidh Barbour will provide additional content and reporting. Celtic go into the match in the Greek capital knowing a win will send them through to a Champions League play-off clash against either Swedish side Malmo or Videoton of Hungary. However, the Hoops were held 1-1 at home in last week’s first leg and face a tough task to get past the Greek champions. Coverage begins at 6.30pm on Tuesday August 14 on BT Sport 2.